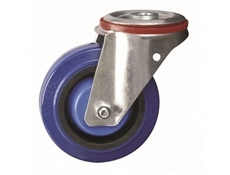 Die- Pat medium duty pressed steel castors available in bolt hole or plate fittings. Elastic rubber tyre with a nylon centre in a range of diameters: 80mm, 100mm, 125mm, 160mm, offering load capacities of: 150kg, 200kg, 350kg, 400kg. Press steel fork assembly zinc plated with a swivel head and double ball race and head seal. Plain bearing hub complete with thread guards and offer colour coded thread guards on 100mm castors, zinc plated metal thread guards on all other sizes. 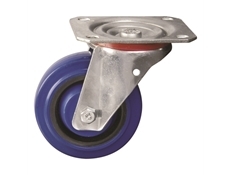 Both bolt hole and plate fitting castors combine swivel and wheel brakes.